Although the first steps of tango were improvised on the streets, nowadays the dance have reached an incomparable level of sophistication. Although the first steps of tango were improvised on the streets, nowadays the dance have reached an incomparable level of sophistication. There are shows that go around the world but, it is especially at the milongas’ dance floor where the most experienced amateurs express themselves. Tango is danced in couples, a sensual and complex improvisation with rules and codes. 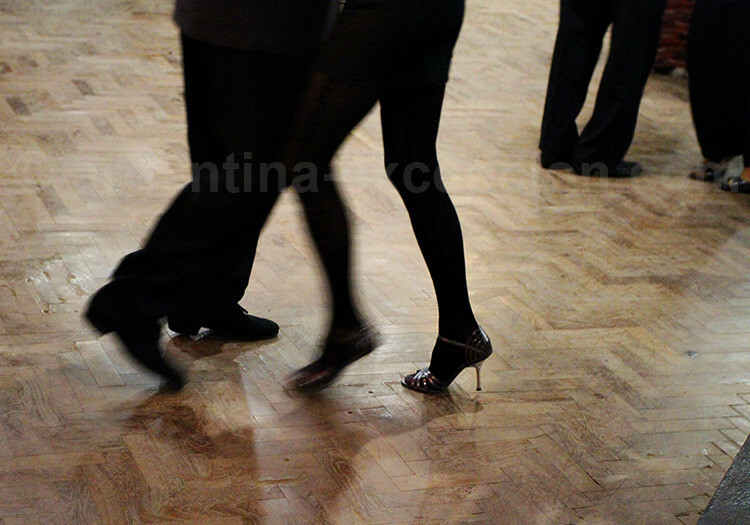 The first tango rule is caminar (to walk) around the dance floor anticlockwise. The man goes forward, first the chest, then the knee and finally the foot. He marks the rhythm delicately suggesting his partner the elegance of the movements and figures. The woman “listens to him”, allows him to lead with absolute trust. Cortes, quebradas, boleos, ganchos… the strict figures require months or even years of practice until they can be delicately danced. Tango implies style and communication between the two partners; it requires to be danced with feelings, with the heart. If the dancers look serious it is not because they are sad but concentrated, immersed in the music and movements of the other. In other times, the first steps were seen in a family environment, in parties with friends. You had to know how to dance before daring to go onto the dance floor, dressed elegantly, men had to wear suits and women had to carry high heels and skirts with deep openings. The dressing rules are more flexible now but tango shoes are still the rule. 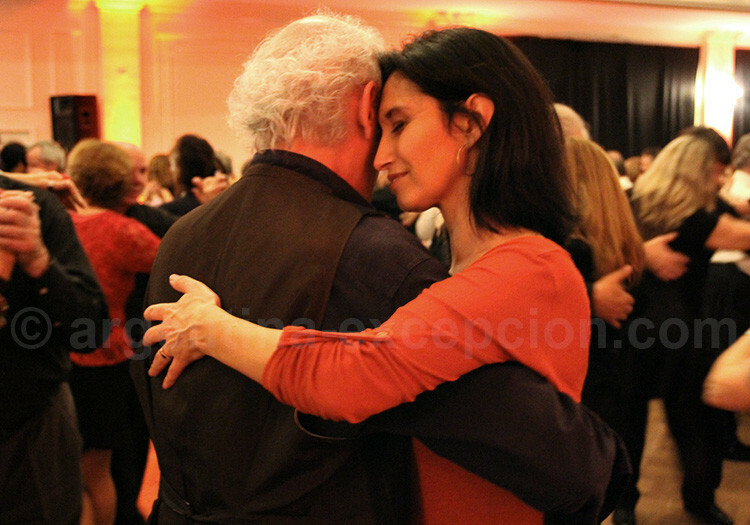 The milonga is, in turn, the name of a musical style and the place where you can go to dance, the ballroom. A dance floor preferably parquet-paneled and with tables around. Those that frequently go to the milonga have their own table; the others have to wait to be placed, usually men on one side and women on the other. The invitation is made with the exchange of looks in the distance followed by the consent expressed by a soft cabeceo. Afterwards, the two partners meet at the dance floor. They generally dance only one tanda: a sequence of four musical pieces and when they are finished, each dancer goes back to his place. The interval takes some minutes and is called cortina, time for going back to the table and choosing another partner. Three musical styles are heard and danced in the ballroom: milonga, with its fast rhythm, Argentine waltz and the ruling tango itself. Sometimes orchestras play music at the milongas. 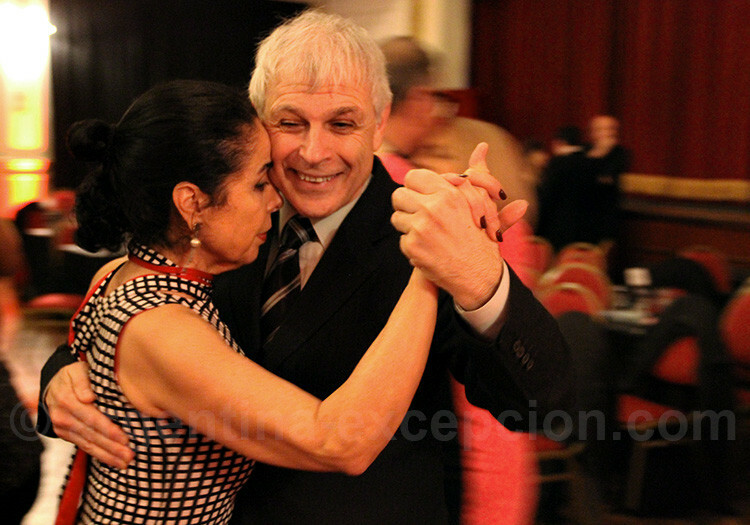 The choice of the milonga, among the ten usually held in Buenos Aires, shall be made taking into account the place, the disc-jockey and the organizer. The prevailing dancing style in Buenos Aires is tango milonguero, danced intertwined, and making open figures (ballroom tango), dance floor dimensions permitting. 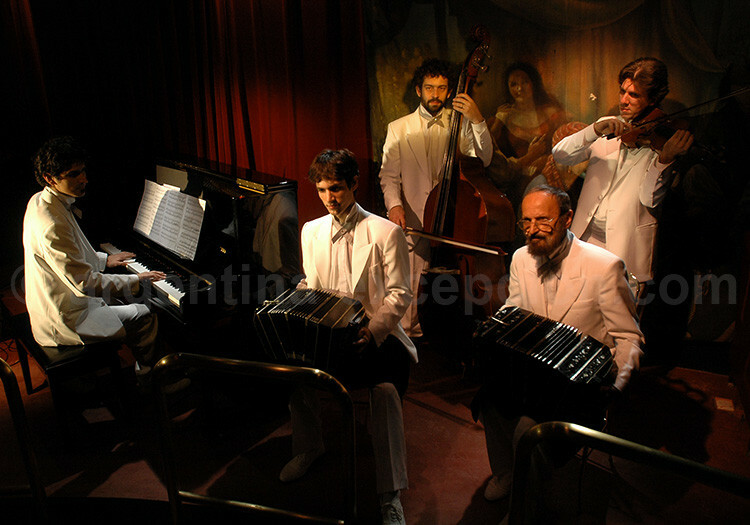 In the last years, a new type of tango has been developed: tango nuevo (new tango) with open, complex figures being more similar to the expertise seen in the shows. Followers of this type of tango have chosen classical tangos as well as electronic tangos (Gotan Project, Tanghetto, Bajo Fondo Tango Club), those that could never be heard at a traditional milonga. In today milongas, many generations are found. You will always find seventy-year-old well-preserved dancers, those that learnt the style before, in the first half of the 20th century. Those that were completely alone when tango was left aside for rock but that eventually managed to transmit their culture to the youth that have been re-discovering tango for almost twenty years. They were witness to a phenomenon that has been perfectly preserved; they are the masters of the dance floor. The reason why there are so many milongas in Buenos Aires is due to the enthusiasm caused by tango around the world, from Finland to Japan, going past France and the United States. 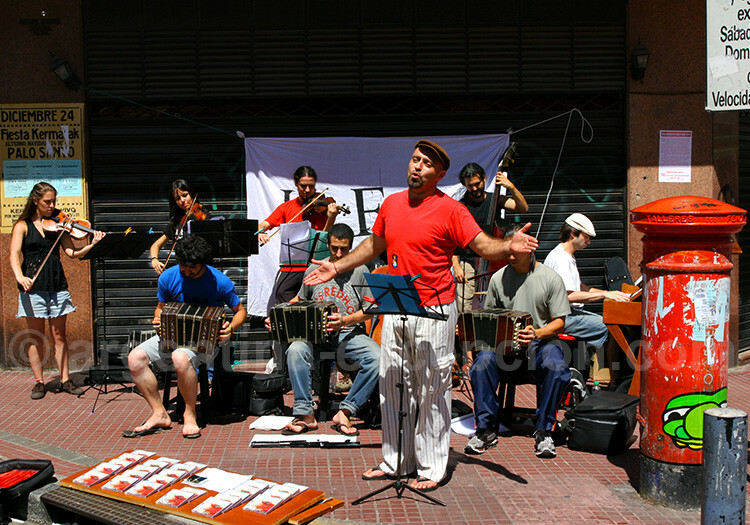 Any passionate dancer someday gets to Buenos Aires, and some of them even decide to stay here. Thus, the milonga has become one of the few places where there are no social, age or language barriers. – El Canning, Scalabrini Ortiz 1331 (Palermo). Despite not being the most attractive place, it offers one of the most beautiful dance floors of the city. It is recommended to go on Mondays, Tuesdays and Fridays. Organized by Parakultural and Omar Viola, one of the pioneers to revive the milongas in 1985. – Niño Bien, Centro Región Leonesa, Humberto Primo 1462 (San Telmo). One of the best known and most beautiful milongas of the city. It is recommended to go on Thursdays. – El Beso, Riobamba 416 (downtown). One of the best renowned milongas with the best dancers. From Tuesdays to Sundays. – Viejo Correo, Díaz Vélez 4820 (Centenario Park). One of the oldest milongas with tiled floors. – Plaza Bohemia, Maipú 444 (downtown). A small dance hall downtown. It is especially recommended to go on Saturdays. On Wednesdays: La Marshall, a gay milonga. – La Viruta, Armenian Association, Armenia 1366 (Palerm). A very large underground dance floor from Wednesday to Fridays. One of the most accessible milongas for beginners. – Confitería La Ideal, Suipacha 384 (downtown). By far, the most touristic milonga inside a mythic café and an outdated decoration. – Club Villa Malcolm (Córdoba 5064) and Práctica X (Anchorena 641): for followers of the new tango. – Free outdoor milongas: Glorieta de Barrancas de Belgrano (11 de Septiembre and Echeverría) and Dorrego Square on Sundays (San Telmo). – And also : Lo de Celia (Humberto Primo 1783), Dandi (Piedras 936), Porteño y bailarín (Riobamba 345), La Nacional (Alsina 1465), Gricel (La Rioja 1180), Nuevo Salón La Argentina (Bartolomé Mitre 1759), La Catedral (Sarmiento 4006), Club Independencia (Independencia 572), etc. – The website El portal del Tango.